We want to be your new homebuilder! 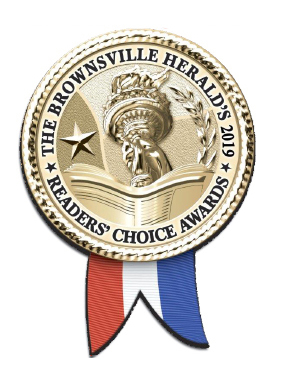 We are proud and honored to have been awarded the Brownsville Herald’s 2018 Reader’s Choice Award. We are grateful for the vote of confidence given to us by our community and we will continue to strive to be our best. As a locally owned family business, we believe that quality does not have to be sacrificed to build a reasonably priced home. Our homes are inspected and certified by FHA, VA, Energy Star, Texas Windstorm, and Municipal Inspectors. Each Home comes with a 1 year Limited Warranty, provided by SIMMONS HOMES and a 10 year Insured HOME of Texas Warranty. Compare our standard DESIGN FEATURES: 100% Brick, Vaulted Ceilings, Granite Kitchen Countertops, Deluxe Factory Built Cabinets, Marble Vanity Tops, Tile Floors, Carpet in Bedrooms, Satin Nickel Hardware, Bath Accessories, and Light Fixtures, Decorative Interior & Exterior Doors, Security System, Backyard Wood Fence, and Landscaping are included in most homes and other amenities are available for purchase. The LOCATION of your new home is important. Simmons Point and River’s Edge at Santander, and The Oaks are located near Brownsville’s award winning schools: Ortiz and Yturria Elementary, Manzano and Stell Middle Schools, Nationally Recognized Veterans Memorial & James Pace Early College High Schools. Other conveniences include: Valley Regional Medical Center, premier shopping areas such as Las Tiendas, Morrison Crossing, Kohl’s, Wal-Mart, and numerous restaurants. We are in north Brownsville’s growth area! Simmons Point and River’s Edge are both Santander communities so a Homeowner’s Association fee of $160 per year is charged for the maintenance of the common areas; for example, the fence, sprinkler system, and landscaping of common areas. The Oaks does not require a Homeowner’s Association fee since it is an independent community with Restrictions in place. Ask us about The Oaks, our newest north Brownsville community.